Castle Group Ltd are a long standing leading manfacturer of noise measuring equipment, particularly Sound Level Meters for industrial noise monitoring. Our equipment is ideal for performing noise at work assessments to The Control of Noise at Work Regulations 2005. With a history spanning back to 1971, our ever unique approach to problem solving helps us lead market trends. 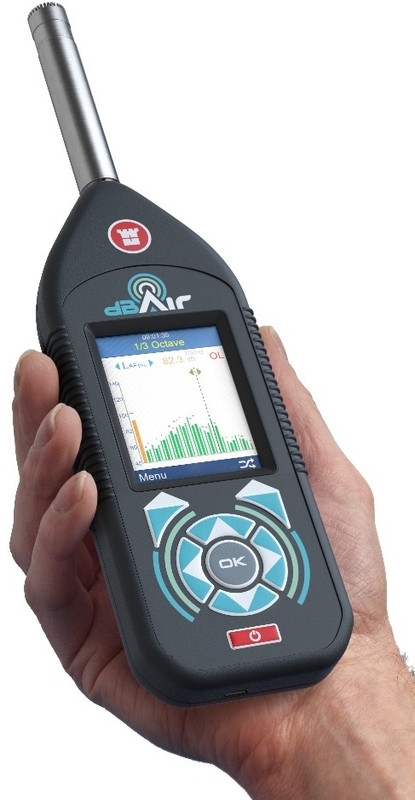 Most recently our dBAir Sound Level Meter has an all new WiFi Data Transfer as a standard feature, removing the problems and limitations of using a cable. To ensure employee's hearing is protected from excessive noise in the workplace. Excessive noise is noise that has the potential to damage their hearing. HSE states that at a minimum a Class 2 Sound Level Meter to BS EN ISO 61672-1:2003 or BS EN 60804:2001 should be used. Meters that do not meet these standards should not be used for Noise at Work measurements. Class 1 Sound Meters are a popular choice with safety professionals, as they give more accurate readings and are capable of other applications that require a higher grade. If you're new to Noise at Work, why not read our Ultimate Guide to Noise at Work to help you get started. Employees must not be exposed to levels over 87 dB, taking into account any reductions from hearing protection. Designed specifically for Safety Managers, the dBAir Safety Managers System comprises everything you require to carry out assessments to the Control of Noise at Work Regulations 2005, as well as being the ideal system for International Occupational Health Monitoring. The Castle dBAir works wirelessly with The Castle Cloud software and it's FREE to use! Make your account today at www.TheCastleCloud.com. All dBAir Systems come with a 3 Year Pro licence. This Sound Level Meter System with Octave Bands is the ideal system for the professional Health and Safety Manager with occupational noise monitoring duties. The system provides you with an Sound Level Meter with Octave Bands (either Class 1 or Class 2), an Acoustic Calibrator, Rubber Case, Attache Protective Carry Case and Cloud Software for three years. This sytem will help you take full control of the occupational noise exposures to your employees in your workplace. Workplace Noise Measurements with Castle Sonik-S The SONIK-S helps you protect your workforce from over exposure to noise, and helps you ensure your company is complying with The Control of Noise at Work Regulations 2005. With it’s simple measurement set up and intuitive interface, the SONIK-S makes conducting occupational noise surveys simple and straightforward. Housed in a modern and attractive body, it has a large colour screen, easy to use interface and is fully compliant with IEC 61672-1:2013 and IEC61252:1993. Scroll down to read more. SONIK-SE Sound Meter - For Assessing Occupational and Environmental Noise The SONIK-SE is a power sound level meter which is ideal for performing occupational and environmental noise assessments for a variety of applications. This Occupational Noise Measurement System is designed to give Health and Safety Managers, or any other professional with responsibilities for managing noise in the workplace, everything they need to protect your workforce from over exposure to noise and to help you ensure your company is complying with The Control of Noise at Work Regulations 2005.